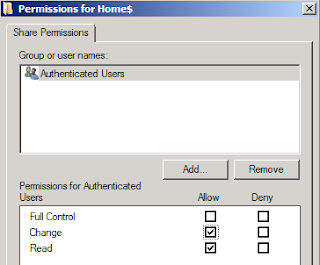 Configuring home directory for domain users, you should add root share that will contain the user home directory, and configure the permissions on home folder. 1. At file server, log in as Domain Administrator. 2. Launch "Windows Explorer", create a new folder which is named "Home" in C drive. 3. Right-click "Home", select "Properties". Remark: For Windows Server 2003, you should select "Share this folder". 6. Check "Share this folder". 7. Next to "Share name", type "Home$". ﻿﻿Remark: For security reason, you should use hidden share. 9. Remove "Everyone", add "Authenticated Users". 10. Check Allow "Read" and "Change". 15. Un-check "Include inheritable permissions from this object's parent". 17. 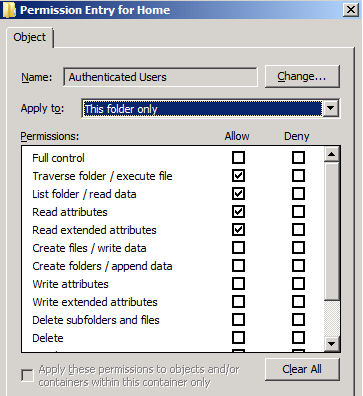 Remove "Users" in the permission entries. 19. 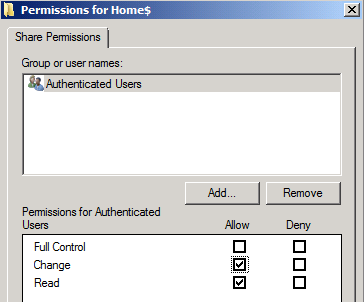 In the "Permission Entry for Home", check Allow "Traverse folder / execute file", "List folder / read data", "Read attributes" and "Read extended attributes". 20. Next to "Apply to", select "This folder only". 24. 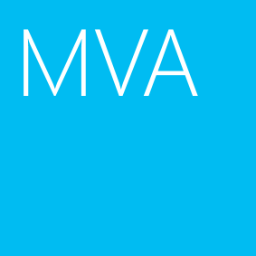 Launch "Active Directory Users and Computers", select a user's properties. 26. 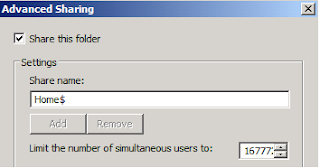 Next to "Home folder", select "Connect". 27. Next to "To", type \\<Server Name>\home$\%username%. 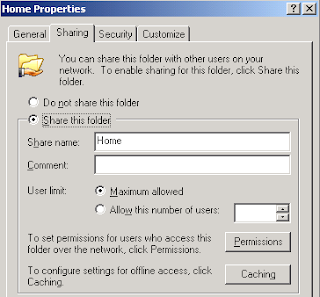 As a result, the user's home folder is created in the home folder of the file server.